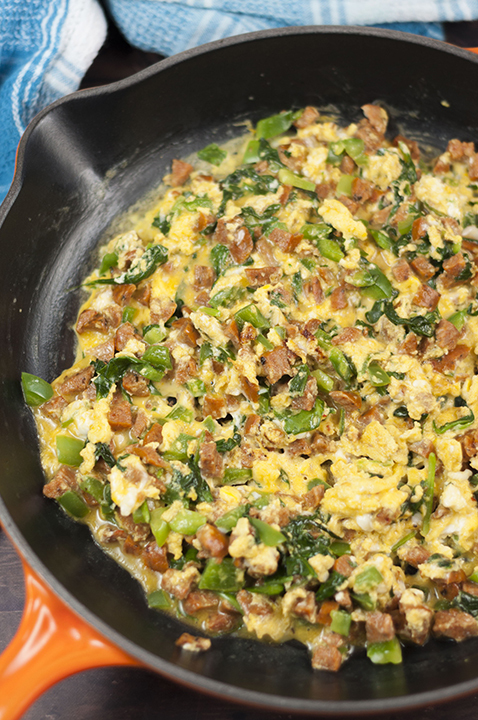 Baked Sausage, Spinach and Egg Breakfast Taquitos are crispy, cheesy, and the perfect easy recipe for a grab-and-go breakfast or “brinner”! Mr. Wishes LOVES breakfast. I mean LOVES. He really only takes the time (or has the time) to eat it when he’s on vacation. Before we leave on a trip, he always says “I can’t wait for breakfast every morning”. He loves these Sausage, Spinach and Egg Breakfast Taquitos. Normal people look forward to the beach or the warm weather or sleeping in…..nope, not him. He wants to eat the biggest breakfast he possibly can that leaves him full until dinner time (sometimes he’s not even hungry for dinner). Needless to say, he loved these Baked Sausage, Spinach and Egg Breakfast Taquitos. Want to know what I ate for breakfast every day while in Mayakoba, Mexico? Guacamole and chips! I love it when breakfast buffets have lunch options! Yup, 9 a.m. and Ashley has guacamole, tortilla chips, and salsa verde. I’m surprised I still fit into my pants by the end of the week. I consumed so much guacamole on that trip that word got around the resort and the employees actually delivered fresh guacamole to our room every night. I should have been embarrassed, but I have no shame. So, these taquitos. These are seriously, horrifyingly, embarassingly easy. They don’t have guacamole in them, but they remind me of some of the breakfast food we enjoyed down in Mexico. Instead of traditional sausage, I wanted to lighten them up and use chicken sausage. That’s where Zweigle’s all natural, gluten-free chicken sausage comes in. With 5 different flavors to choose from, they make it so easy to incorporate it into just about any savory meal or appetizer that contains beef or pork. I used the Chorizo style in this recipe because I figured it would go perfectly with the taquitos, but they also have Spinach and Feta, Italian, Buffalo Style, and Lime Chipotle! See, I really wasn’t joking when I said there is a flavor to go with any dish. Did you know that Zweigle’s is a 5th generation family-owned local business here in my hometown of Rochester, NY? Well, now you know! I have lots of love for my local fave! They truly make the best tasting chicken sausage in all the land. 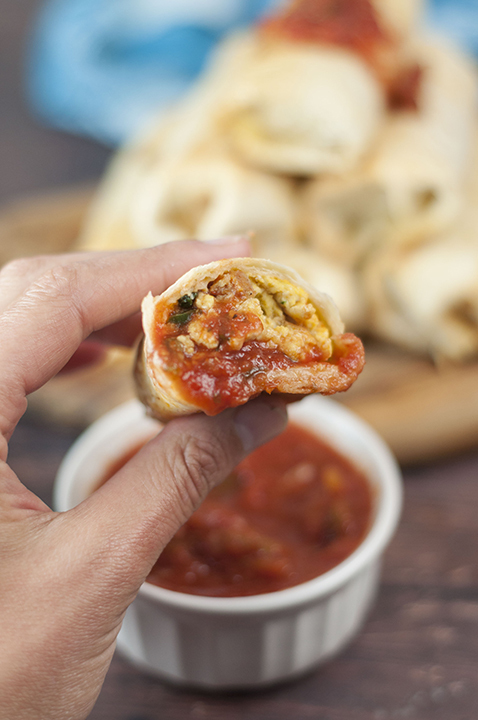 Oh, did I mention that these Baked Sausage, Spinach and Egg Breakfast Taquitos are freezer-friendly? They are what I will make for breakfast every day that I actually wake up early enough (never) and what I will make when I have no idea what else to make for dinner. That’s pretty much all the time, really. 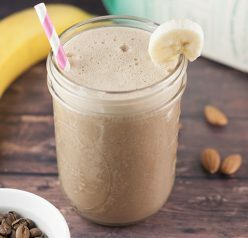 It’s definitely the perfect on-the-go breakfast while keeping that homemade flavor. This will surely become a new family favorite! 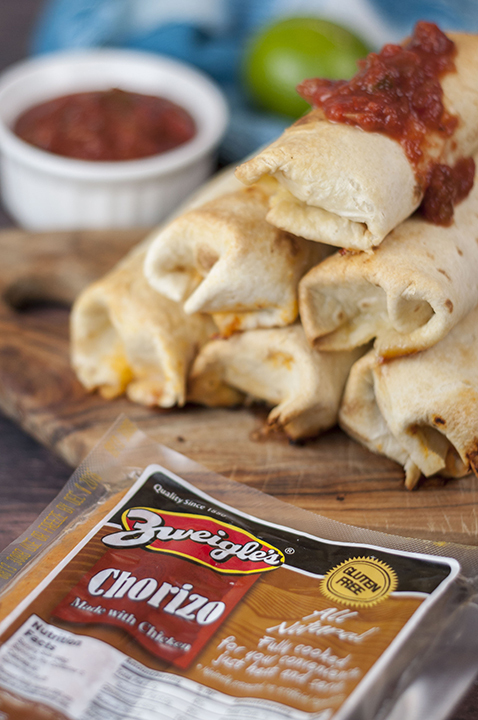 Take a little time and visit the other recipes below that I’ve created for Zweigle’s using their chicken sausage! You won’t regret it! If you don’t have access to Zweigle’s products locally, no need to fret. You can visit their website to purchase their products online. They also have a lot of yummy recipe ideas on their website that you are sure to love. 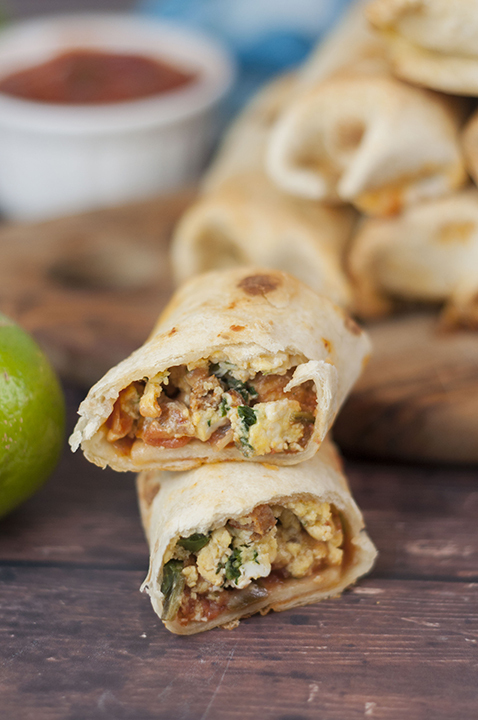 Baked Sausage, Spinach and Egg Breakfast Taquitos are crispy, cheesy, and the perfect easy recipe for a grab-and-go breakfast or "brinner"! Brown sausage in a large skillet over medium heat (sausage is already cooked, you just want to give it some color). Add chopped spinach and green pepper and saute for a few minutes. In a separate bowl, whisk eggs and add to skillet. Stir until eggs are just cooked through. Remove the skillet from heat and stir in the Feta cheese. Microwave tortillas for 20-30 seconds to make them more pliable. Divide filling evenly between tortillas (depending on size, you may have more or less than 8 taquitos). 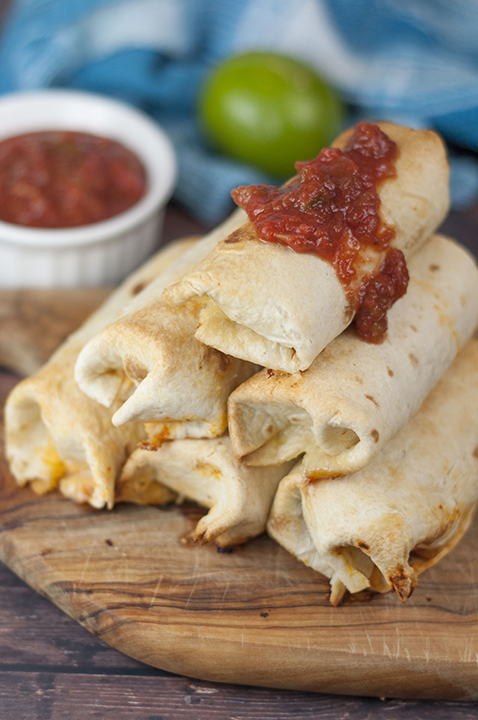 Top each with shredded cheese and a spoonful of salsa. Roll up tightly and place seam-side down, on a baking sheet. Brush taquitos lightly with olive oil and sprinkle with a little salt. Bake for 10-15 minutes or until crispy, turning over once halfway through baking. Serve with extra salsa or toppings of your choice for dipping. This sounds like an awesome breakfast. Sometimes I get tired of muffins all the time, so it would be fun to switch things up and have a little salsa in the mornings! This sounds so yummy! I love healthy food I can take on the go. 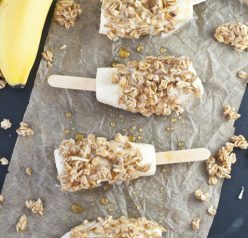 Those look so yummy, I’d love these for breakfast! This sounds like thee perfect breakfast! This dish seems so palatable and easy to make. 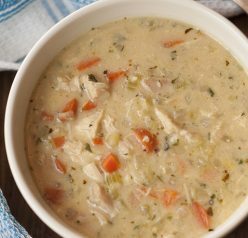 Thanks a bunch for providing such a detailed and exceptional recipe!